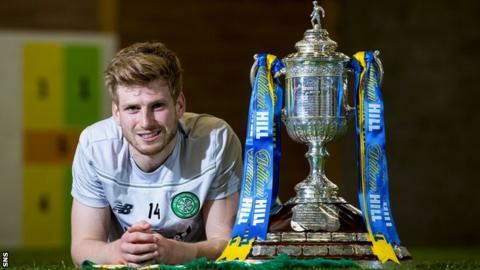 Celtic's Stuart Armstrong is eager to make his mark in Sunday's Scottish Cup meeting with Rangers after missing out on last year's semi-final. Midfielder Armstrong was ineligible for Celtic's 3-2 extra-time defeat by Inverness Caledonian Thistle last term. However, he helped Dundee United overcome Rangers at the last-four stage the season before. "If we could experience those sorts of emotions again this weekend it would be great," said Armstrong, 24. "It's useful that you have experienced these kind of big games before, those pressurised games. This one will be slightly different but again the stadium will be full, so it's nice I've had that experience before. "I was cup-tied for last year's Scottish Cup semi-final against Inverness but played the year before for United against Rangers at Ibrox. "That was a great game for us. I scored and it was an all round great day." Armstrong joined Celtic from United shortly after Ronny Deila's side had beaten Rangers in last season's League Cup semi-final. "I don't think you can treat it like any other game because it's not," he explained. "It's a big tie, a chance to get to the final. It's Celtic against Rangers. "I think it will be a good experience. It's something I've never seen live, something I've never experienced before. It's exciting. "I haven't given it too much thought, what it will be like. I haven't really had a chance to speak to the other guys who have played in them before. "But I'm sure there will be a bit of chat about that this week leading up to the game. "I think it will be a good game with lots of chances. They like to score goals and so do we, so I'm sure it will be a good one to watch. "There will be a lot of pressure on both sides and a lot of expectation."